For some reason, the summer months always seem to get a little busy, and this summer has been no exception. I hope to write part 2 of the fluctuation-dissipation post soon, but in the meantime, here are a couple videos that I came across recently showing the rather strange properties of mercury. As an undergraduate, I was taught the concept of the “physicist’s proof”, a sort of silly concept that was a professor’s attempt to get us students to think a little harder about some problems. Here, I give you a “physicist’s proof” of the famous Monty Hall problem, which (to me!) is easier to think about than the typical Bayesian approach. Suppose you are a contestant on a game show where there are three doors and a car behind one of them. You must select the correct door to win the car. You therefore select one of the three doors. Now, the host of the show, who knows where the car is, opens a different door for you and shows you that there is no car behind that door. There are two remaining unopened doors — the one you have chosen and one other. Now, before you find out whether or not you have guessed correctly, the host gives you the option to change your selection from the door you initially chose to the other remaining unopened door. Should you switch or should you remain with you initial selection? When I first heard this problem, I remember thinking, like most people, that there was a 50/50 chance of the car being behind either door. However, there is a way to convince yourself that this is not so. This is by taking the limit of a large number of doors. 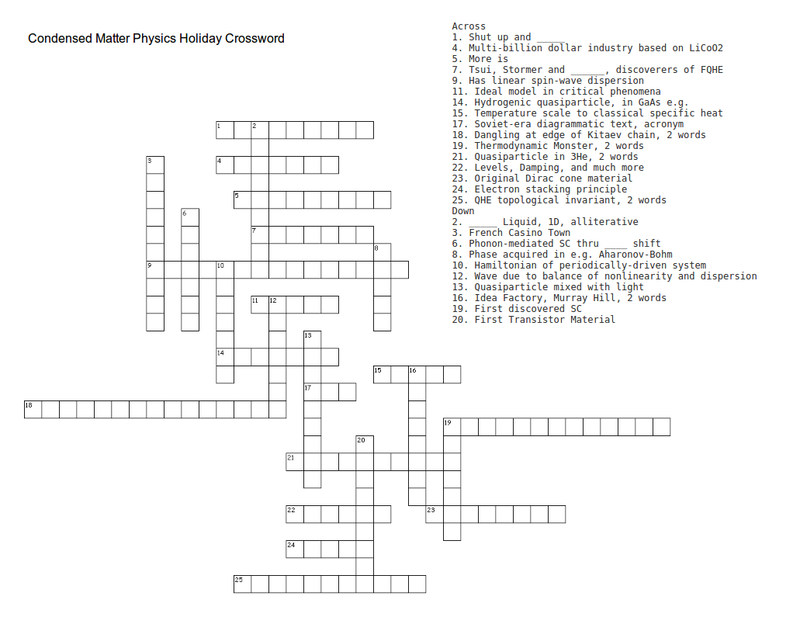 I’ll explain what I mean in a second, but let me just emphasize that taking limits is a common and important technique that physicists must master to think about problems in general. In Einstein’s book, Relativity, he describes using this kind of thinking to point out absurd consequences of Galilean relativity. Einstein imagined himself running away from a clock at the speed of light: in this scenario, the light from the clock would be matching his pace and he would therefore observe the hands of the clock remaining stationary and time standing still. Were he able to run just a little bit faster than the light emanating from the clock, he would see the hands of the clock start to wind backwards. This would enable him to violate causality! However, Einstein held causality to be a dearer physical truth than Newton’s laws. Special relativity was Einstein’s answer to this contradiction, a conclusion he reached by considering a physical limit. Now, let us return to the Monty Hall problem. And this time, instead of three doors, let’s think about the limit of, say, a million doors. In this scenario, suppose that you have to choose one door from one million doors instead of just three. For the sake of argument, suppose you select door number 999,983. The host, who knows where the car is, opens all the other doors, apart from door number 17. Should you stick to door 999,983 or should you switch to door 17? Let’s think about this for a second — there are two scenarios. Either you were correct on your first guess and the car is behind door 999,983 or you were incorrect on your first guess and the car is behind door 17. When you initially made your selection, the chance of you having made the right guess was 1/1,000,000! The probability of you having chosen the right door is almost zero! 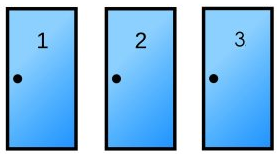 If you had chosen any other door apart from door 17, you would have been faced with the same option: the door you chose vs. door 17. And there are 999,999 doors for you to select and not win the car. In some sense, by opening all the other doors, the host is basically telling you that the car is behind door 17 (there is a 99.9999% chance!). To me, at least, the million door scenario demonstrates quite emphatically that switching from your initial choice is more logical. For some reason, the three door case appears to be more psychologically challenging, and the probabilities are not as obvious. Taking the appropriate limit of the Monty Hall problem is therefore (at least to me) much more intuitive! Especially for those who are soon to take the physics GRE — remember to take appropriate limits, this will often eliminate at least a couple answers! It is a bizarre answer, but Bayesian results often are. 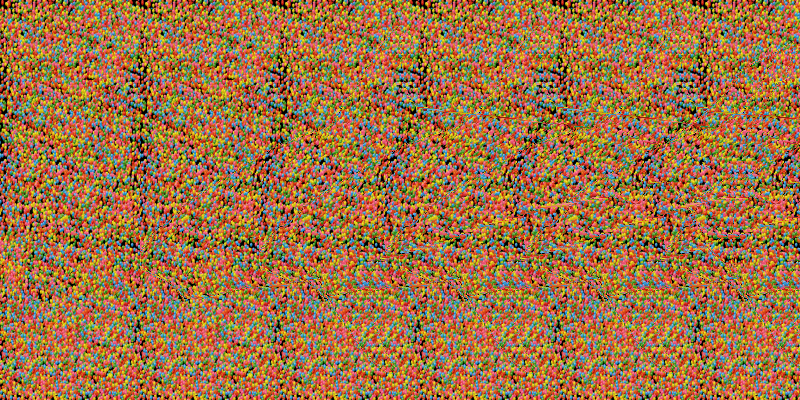 The bizarre thing about these images is that if you look at them like you would a Magic Eye image, the differences between the two images essentially “pop out” (or rather they flicker noticeably). Because each of your eyes is looking at each image separately, your brain is tricked into thinking there is a single image at a certain depth. Therefore, the differences reveal themselves, because while the parts of the image that are identical are viewed with a particular depth of view, the differences don’t have the same effect. Your eyes cannot triangulate the differences, and they appear to flicker. 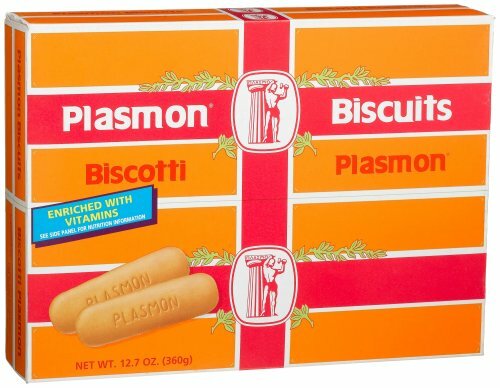 I wish I had learned this trick in middle school, when this game was all the rage. I won’t tell you where the defects are, but just to let you know that there are three quite major ones, which are the ones I’m referring to in the image. They’re quite obvious even if not viewed stereoscopically. Because so many concepts in solid state physics depend on crystal symmetries and periodicity, I can foresee entertaining myself during many more dry seminars in the future, be it a seminar with tons of TEM images or a wealth of diffraction data. I have even started viewing my own data this way to see if anything immediately jumps out, without any luck so far, but I suspect it is only a matter of time before I see something useful. On a recent plane ride, I was able to catch an episode of the new PBS series Genius by Stephen Hawking. I was surprised by the quality of the show and in particular, its emphasis on experiment. Usually, shows like this fall into the trap of giving one the facts (or speculations) without an adequate explanation of how scientists come to such conclusions. However, this one is a little different and there is a large emphasis on experiment, which, at least to me, is much more inspirational.